Browse fungicides suppliers by country and region. Ampelomyces quisqualis CFU Formulation 2 x 108 per gmWettable Powder (WP) 2 x 108 per mlAqueous Solution (AS) Tierra Overseas is manufacturer and exporter of high quality Ampelomyces quisqualis in India. Mode of ActionOnce the product is applied, after gaining moisture- conidia are discharged from the ripe pycnidia and are dispersed by rain-splash to mildew colonies. For infection, free water is required, while infection is favoured by warm temperatures (20-30Â° C). If conditions are favourable, infection can occur in less than 24 hours. The mycoparasite directly penetrates the walls of hyphae, conidiophores and immature cleistothecia, but may be unable to infect mature cleistothecia. For the next 7-10 days, the mycoparasite spreads within the hyphae of the host colony without killing it after which the process of pycnidial formation begins which is completed within 2-4 days. Infected cells generally die soon after pycnidial formation begins. BenefitsThe fungus Ampelomyces quisqualis infects and forms pycnidia (fruiting bodies) within powdery mildew hyphae, conidiophores (specialized spore-producing hyphae), and cleistothecia (the closed fruiting bodies of powdery mildews). 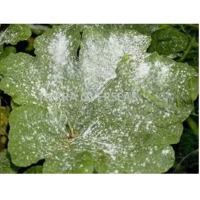 This parasitism reduces growth and kills the mildew colony. The mycoparasite is specific to powdery mildews (Erysiphales), but has an extremely broad host range within this diverse group of important plant pathogens. Eco-FriendlyExtremely safe to mammals, human beings, animals, natural parasites, predators, non target insects, fishes, birds, etc. No phytotoxicity and exempted from residue analysis. Method of UseMix recommended quantity of the product with well decomposed farm yard manure or farm soil and broadcast during the last ploughing or sowing followed by irrigation. An evening time is ideal for broadcasting this product. In case of liquid formulation, shake the bottle well before use. Once a bottle is opened the entire content is to be used at once. This product should not be mixed with any antibacterial agent or any chemical fertilizer. Recommended forMillets, Oilseeds, Fruits & Vegetables, Coconut, Oil palm, Cotton, Chilly, Lime, Tea, Banana, Flowers, Spices, Contiments, Herbs, Perinnial trees. Dosage2.5 kg per ha or 2 ltr per ha StorageStore the bottles in a cool and dry place away from direct heat and sunlight. NoteWe can provide a consortium/mixture of various bacteria/fungi/micro organisms as per requirement. Azospirillum lipoferum Extensive genetic, biochemical and ecological studies have ranked Azospirillumas one of the best characterized general among associative plant growth promoting rhizobacteria. Tierra Overseas is manufacturer and exporter of high quality Azospirillum lipoferum in India. CFU Formulation 1 x 10^9 per gm Aqueous Solution (AS) 1 x 10^9 per ml Wettable Powder (WP) Mode of Action	Under micro-aerobic conditions at low nitrogen levels, Azospirillum can convert atmospheric nitrogen into ammonium through the action of the nitrogenase complex. This enzyme is built from two components: the dinitrogenase protein (MoFe protein, NifDK), which contains a molybdenum-iron cofactor, is the site of N2 reduction; the dinitrogenase reductase protein (Fe protein, NifH) transfers electrons from an electron donor to the nitrogenase protein. Auxins, Cytokinins and Gibberellines are types of plant growth promoting substances detected in the supernatant of Azospirillum cultures. Auxin indole-3-acetic acid (IAA) is the quantitatively most important phytohormone produced by Azospirillum. Bacterial phytohormone production causes the detected changes in root morphology after Azospirillum inoculation, which in turn may be related to enhance mineral uptake. Benefits	An increased number of lateral roots and root hairs enlarges the root surface available for nutrients. This results in a higher nutrient uptake by inoculated roots and an improved water status of the plant, which in turn could be the main factor enhancing plant growth. It can be used for seed treatment, Seedling dipping, Sett tratement, Soil application and for Plantation crops. Eco-Friendly	Extremely safe to mammals, human beings, animals, natural parasites, predators, non target insects, fishes, birds, etc. Classified as Class â?? IV, low hazardous (green label) pesticide. No phytotoxicity and exempted from residue analysis. Method of Use	Mix recommended quantity of the product with well decomposed farm yard manure or farm soil and broadcast during the last ploughing or sowing followed by irrigation. An evening time is ideal for broadcasting this product. In case of liquid formulation, shake the bottle well before use. Once a bottle is opened the entire content is to be used at once. This product should not be mixed with any antibacterial agent or any chemical fertilizer. Recommended for	Millets, Oilseeds, Fruits & Vegetables, Coconut, Oil palm, Cotton, Chilly, Lime, Tea, Banana, Flowers, Spices, Contiments, Herbs, Perinnial trees. Dose : 2.5 kg per ha or 2 ltr per ha Storage : Store the bottles in a cool and dry place away from direct heat and sunlight. Note : We can provide a consortium/mixture of various bacteria/fungi/microorganisms as per requirement. Bacillus megaterium (Phosphate Solubilising Bacteria) Importance of Phosphorous An adequate supply of phosphorus during early phases of plant development is important for laying down the primordia of plant reproductive parts. It plays significant role in increasing root ramification and strength thereby imparting vitality and disease resistance capacity to plant. It also helps in seed formation and in early maturation of crops like cereals and legumes. Poor availability or deficiency of phosphorus (P) markedly reduces plant size and growth. Phosphorus accounts about 0.2 0.8% of the plant dry weight. Symptoms of Phosphorous Deficiency The plants are usually dark bluish-green in color with leaves and stem becoming purplish. The degree of purple is influenced by the genetic makeup of the plant, with some hybrids showing much greater discoloration than others. The purplish colour is due to accumulation of sugars that favours the synthesis of anthocyanin (a purplish-colored pigment), which occurs in the leaves of the plant. Tierra Overseas is manufacturer and exporter of high quality Bacillus Megaterium (Phosphate Solubilising Bacteria) in India. CFU Formulation 1 x 109 per ml Aqueous Solution (AS) 1 x 109 per gm Wettable Powder (WP) Mode of Action	The use of phosphate solubilizing bacteria as inoculant simultaneously increases P uptake by the plant and crop yield. Benefits Lowers pH of the soil in high pH land. Forms soluble complexes with metal ions associated with insoluble P (Ca, Al, Fe) and thus P is released. Organic acids produced can either directly dissolve the mineral P as a result of anion exchange of phosphate by acid anion or can chelate Fe, Al and Ca ions associated with P. Increases resistance to disease and drought tolerance. Reduces the requirement of phosphate fertilizer by up to 25% initially. Can be used for Seed, Seedling, Sett and Plantation crop treatment. Method of Use : Mix recommended quantity of the product with well decomposed farm yard manure or farm soil and broadcast during the last ploughing or sowing followed by irrigation. An evening time is ideal for broadcasting this product. In case of liquid formulation, shake the bottle well before use. Once a bottle is opened the entire content is to be used at once. This product should not be mixed with any antibacterial agent or any chemical fertilizer. Recommended for Millets, Oilseeds, Fruits & Vegetables, Coconut, Oil palm, Cotton, Chilly, Lime, Tea, Banana, Flowers, Spices, Contiments, Herbs, Perinnial trees. Dose 0 kg per ha or 2 ltr per ha Storage Store the bottles in a cool and dry place away from direct heat and sunlight. Dose 10 kg per ha or 2 ltr per ha Storage Store the bottles in a cool and dry place away from direct heat and sunlight. Note We can provide a consortium/mixture of various bacteria/fungi/micro organisms as per requirement. Frateuria aurentia (Potash Mobilizing Bacteria) KMB Potassium (K) is very essential for plant growth and is usually found abundant in soil. Total K (Potassium) content in soil ranges between 3,000 to 100,000 kg/ha in the upper 0.2 mt of the soil profile. Of this total K content 98% remains bound in the mineral form whereas 2% is in soil solution and exchangeable phases. Importance of Potassium in Plants Potassium plays a vital role in the formation of amino acids and proteins from ammonium ions, which are absorbed by roots from the soil. It is also responsible for the transfer of carbohydrates, proteins etc. from the leaves to the roots. It plays a vital role in the uptake of other elements like nitrogen, phosphorous and calcium. It increases the hydration of protoplasm. It activates number of enzymes and its deficiency decreases photosynthesis. Potassium increases the resistance of crops to hot and dry conditions and to insect pests and diseases. It improves the quality of fruits and grains. Tierra Overseas is manufacturer and exporter of high quality Frateuria aurentia (Potash Mobilizing Bacteria) KMB in India. CFUFormulation 1 x 109 per gmGranules (GR) 1 x 109 per mlAqueous Solution (AS) Mode of Action Mobilizes fixed Potash to available form for crops. BenefitsReduce cost of potash application by up to 50% initially. Improves resistance of crop plants. Suitable to a wide range of soil pH and temperature. Suitable to apply to all crops. Improves crop growth and yield by up to 20%. Compatible with other beneficial microbes in the rhizosphere. Encourages soil health and soil fertility. Secretes growth hormones to increase crop productivity. Benefits the next crop also due to its residual effect. Eco-Friendly The product is extremely safe and non-toxic to human beings, plants, animals, birds, fishes and all other non target organisms. Contains no phytotoxicity and exempted from residue analysis. Method of UseMix recommended quantity of the product with well decomposed farm yard manure or farm soil and broadcast during the last ploughing or sowing followed by irrigation. An evening time is ideal for broadcasting this product. In case of liquid formulation, shake the bottle well before use. Once a bottle is opened the entire content is to be used at once. This product should not be mixed with any antibacterial agent or any chemical fertilizer. Recommended for Millets, Oilseeds, Fruits & Vegetables, Coconut, Oil palm, Cotton, Chilly, Lime, Tea, Banana, Flowers, Spices, Contiments, Herbs, Perinnial trees. Dose5 kg per ha or 2 ltr per ha StorageStore the bottles in a cool and dry place away from direct heat and sunlight. NoteWe can provide a consortium/mixture of various bacteria/fungi/micro organisms as per requirement. Trichoderma harzianum CFUFormulation 2 x 109 per gmWettable Powder (WP) 2 x 109 per mlAqueous Solution (AS) Tierra Overseas is manufacturer and exporter of high quality Trichoderma harzianum in India. Mode of ActionThe hyphae of the microparasite grow directly towards its host and once it reaches the host, the hyphae coils it or gets attached to it by forming a hook like structure. Due to this action, the hyphae sometimes penetrates the mycelium of the host and partially degrades its walls. Trichoderma harzianum produces proteseas which are capable of degrading the pathogen plant cell wall degrading enzymes, and reduces the ability of the pathogen to infect the plant. BenefitsHighly effective on root rot, stem rot and wilt diseases caused by Rhizoctonia, Phytophthora, Schlerotinia, Fusarium, Verticillum and bacterial disease. Damping off caused by Pythium, blights/leaf spots caused by Cercospora, Colletotrichum, Alternaria, Ascochyta, Macrophomina, Myrothecium, Ralstonia, bacterial and fungal diseases of various crops. Eco-FriendlyExtremely safe to mammals, human beings, animals, natural parasites, predators, non target insects, fishes, birds, etc. Classified as Class IV, low hazardous (green label) pesticide. No phytotoxicity and exempted from residue analysis. Method of UseMix recommended quantity of the product with well decomposed farm yard manure or farm soil and broadcast during the last ploughing or sowing followed by irrigation. An evening time is ideal for broadcasting this product. In case of liquid formulation, shake the bottle well before use. Once a bottle is opened the entire content is to be used at once. This product should not be mixed with any antibacterial agent or any chemical fertilizer. Recommended forMillets, Oilseeds, Fruits & Vegetables, Coconut, Oil palm, Cotton, Chilly, Lime, Tea, Banana, Flowers, Spices, Contiments, Herbs, Perinnial trees. Dose2.5 kg per ha or 2 ltr per ha StorageStore the bottles in a cool and dry place away from direct heat and sunlight. NoteWe can provide a consortium/mixture of various bacteria/fungi/micro organisms as per requirement. Short on time? Let fungicides sellers contact you. Trichoderma viride CFUFormulation 2 x 109 per gmWettable Powder (WP) and Granules (GR) 2 x 109 per mlAqueous Solution (AS) Mode of ActionThe pathogen fungi is wrapped around by Trichoderma viride which results in damage of its cell walls due to antibiotics and extracellular enzymes produced by Trichoderma viride. The pathogen fungi gradually collapses and disintegrates. BenefitsTrichoderma viride is an excellent product working very effectively on soil borne diseases like root rot, stem rot, black rot, die back, damping off, fusarium and verticillium wilt. Highly active on root rots caused by Schlerotinia and Rhizoctonia, wilt caused by Fusarium and Verticillium and blights, leaf spots caused by Alternaria, Ascochyta, Cercospora, Macrophomina, Myrothecium, Ramularia. In addition to colonizing roots, Trichoderma attacks, paralizes and gains nutrition from other fungi. The various mechanisms incude antibiosis, antiparasitism, including host plant resistance and competition. This product gives better results than any chemical and is very cost effective. Eco-FriendlyExtremely safe to mammals, human beings, animals, natural parasites, predators, non target insects, fishes, birds, etc. Classified as Class IV, low hazardous (green label) pesticide. No phytotoxicity and exempted from residue analysis. Method of UseMix recommended quantity of the product with well decomposed farm yard manure or farm soil and broadcast during the last ploughing or sowing followed by irrigation. An evening time is ideal for broadcasting this product. In case of liquid formulation, shake the bottle well before use. Once a bottle is opened the entire content is to be used at once. This product should not be mixed with any antibacterial agent or any chemical fertilizer. Recommended forMillets, Oilseeds, Fruits & Vegetables, Coconut, Oil palm, Cotton, Chilly, Lime, Tea, Banana, Flowers, Spices, Contiments, Herbs, Perinnial trees. Dose2.5 kg per ha or 2 ltr per ha StorageStore the bottles in a cool and dry place away from direct heat and sunlight. NoteWe can provide a consortium/mixture of various bacteria/fungi/micro organisms as per requirement. Acetobacter diazotrophicus 1 x 108 per ml 1 x 108 per mlAqueous Solution Mode of Action : Acetobacter diazotrophicus colonizes the root and lower stem epidermal surface which then uses root tips and lateral root junctions to enter the plant where it is distributed around the plant in the transpiration stream. The xylem vessels in the dense shoots of mature plants are also a possible site of N2-fixation by diazotrophs as they provide the low pO2 and energy as sucrose necessary for nitrogenase activity. Benefits Responsible for N2 fixation associated with the plants. Tolerance to low pH, and high sugar and salt concentrations, lack of nitrate reductase. Nitrogenase activity which tolerates short term exposure to ammonia. Eco-Friendly : Extremely safe to mammals, human beings, animals, natural parasites, predators, non target insects, fishes, birds, etc. Classified as Class IV, low hazardous (green label) pesticide. No phytotoxicity and exempted from residue analysis. Method of Use Mix recommended quantity of the product with well decomposed farm yard manure or farm soil and broadcast during the last ploughing or sowing followed by irrigation. An evening time is ideal for broadcasting this product. The recommended quantity can also be used by mixing in 200 litres of water in drip irrigation. Mix Acetobacter diazotrpophicus 5 to 10 ml per lit. of water and spray in standing crop in the evening to get better results. In case of liquid formulation, shake the bottle well before use. Once a bottle is opened the entire content is to be used at once. This product should not be mixed with any antibacterial agent or any chemical fertilizer. Recommended for Sugarcane and Coffee : * Dosage 2 ltr per ha * StorageStore the bottles in a cool and dry place away from direct heat and sunlight. * NoteWe can provide a consortium/mixture of various bacteria/fungi/microorganisms as per requirement. Metarhizium anisopliae CFUFormulation 2 x 109 per gmWettable Powder (WP) 2 x 109 per mlAqueous Solution (AS) Tierra Overseas is manufacturer and exporter of high quality Metarhizium anisopliae in India. Mode of ActionOnce the spores of Metarhizium anisopliae come in contact with the insect cuticle, they germinate and penetrate the body of the insect causing mortality through combination of chemical and mechanical reactions and water and nutrient loss. Gradually the insect body gets covered with green mycelium and spores, which gets dispersed and cause subsequent infections. Toxins such as destruxin produced by this fungus causes the mortality of insects. In addition to this, Metarhizium anisopliae contains entomopathogenic fungus which kill termites, termite queen and white grubs. BenefitsThis product can control all stages of insect such as egg, larvae, pupal, nymphal and adult stages of Termites, White grubs, Beetle grubs, Cutworms, and Sucking pest like Pyrilla. Eco-FriendlyExtremely safe to mammals, human beings, animals, natural parasites, predators, non target insects, fishes, birds, etc. Classified as Class IV, low hazardous (green label) pesticide. No phytotoxicity and exempted from residue analysis. Method of UseMix recommended quantity of the product with well decomposed farm yard manure or farm soil and broadcast during the last ploughing or sowing followed by irrigation. An evening time is ideal for broadcasting this product. In case of liquid formulation, shake the bottle well before use. Once a bottle is opened the entire content is to be used at once. This product should not be mixed with any antibacterial agent or any chemical fertilizer. Recommended forMillets, Oilseeds, Fruits & Vegetables, Coconut, Oil palm, Cotton, Chilly, Lime, Tea, Banana, Flowers, Spices, Contiments, Herbs, Perinnial trees. Dose2.5 kg per ha or 2 ltr per ha StorageStore the bottles in a cool and dry place away from direct heat and sunlight. NoteWe can provide a consortium/mixture of various bacteria/fungi/micro organisms as per requirement. Paecilomyces lilacinus CFUFormulation 2 x 108 per gmWettable Powder (WP) 1 x 108 per mlAqueous Solution (AS) Tierra Overseas is manufacturer and exporter of high quality Paecilomyces lilacinus in India. Mode of ActionThe spore of this fungus infects and kills eggs, juveniles, and young adult of most phytophagous nematode species. The hyphae grows over the surface of the egg. From the bottom of the hyphae, a penetration peg grows into the egg. As the penetration continues, the eggs split and is covered by the hyphae completely. Approximately after 5 days, most of the eggs get infected. The young ones are born infected and die soon. BenefitsPaecilymyces lilacinus protects the controls plant parasitic nematodes such as root knot nematodes, cyst nematodes, citrus nematodes, saving the root system and thus increasing productivity of the crops. Eco-FriendlyExtremely safe to mammals, human beings, animals, natural parasites, predators, non target insects, fishes, birds, etc. Classified as Class IV, low hazardous (green label) pesticide. No phytotoxicity and exempted from residue analysis. Method of UseMix recommended quantity of the product with well decomposed farm yard manure or farm soil and broadcast during the last ploughing or sowing followed by irrigation. An evening time is ideal for broadcasting this product. In case of liquid formulation, shake the bottle well before use. Once a bottle is opened the entire content is to be used at once. This product should not be mixed with any antibacterial agent or any chemical fertilizer. Recommended forMillets, Oilseeds, Fruits & Vegetables, Coconut, Oil palm, Cotton, Chilly, Lime, Tea, Banana, Flowers, Spices, Contiments, Herbs, Perinnial trees. Dose2.5 kg per ha or 2 ltr per ha StorageStore the bottles in a cool and dry place away from direct heat and sunlight. NoteWe can provide a consortium/mixture of various bacteria/fungi/micro organisms as per requirement. Azotobacter Azotobacter are nitrogen-fixing bacteria which fix molecular nitrogen present in the atmosphere; without creating any symbiotic relation with plants. CFU Formulation 1 x 109 per gmAqueous Solution (AS) 1 x 109 per mlWettable Powder (WP) Mode of ActionAzotobacter consists of a range of enzymes required for nitrogen fixation (ferredoxin, hydrogenase and nitrogenase). Nitrogen fixation requires a large amount of energy in the form of adenosine triphosphate. As the process of Nitrogen fixation is highly sensitive, Azotobacter develops a defensive mechanism against oxygen which helps in reduction of oxygen in the cells. Benefits Fixes atmospheric Nitrogen. Increases soil fertility and stimulates plant growth. Decreases the use of Urea (Chemical Fertilizer). Reduces the cost of cultivation. Used for Seed treatment, Seedling dipping, Sett treatment, Soil Application and for Plantation crops. Eco-FriendlyExtremely safe to mammals, human beings, animals, natural parasites, predators, non target insects, fishes, birds, etc. Recommended forMillets, Oilseeds, Fruits & Vegetables, Coconut, Oil palm, Cotton, Chilly, Lime, Tea, Banana, Flowers, Spices, Contiments, Herbs, Perinnial trees. Dose2.5 kg per ha or 2 ltr per ha Method of UseMix recommended quantity of the product with well decomposed farm yard manure or farm soil and broadcast during the last ploughing or sowing followed by irrigation. An evening time is ideal for broadcasting this product. In case of liquid formulation, shake the bottle well before use. Once a bottle is opened the entire content is to be used at once. This product should not be mixed with any antibacterial agent or any chemical fertilizer. StorageStore the bottles in a cool and dry place away from direct heat and sunlight. Thiobacillus thiooxidans Sulphur is one of the 17 essential plant nutrients. It is a macronutrient required by plants for synthesis of enzymes, oils, chlorophyll and vitamins. A deficiency of Sulphur at any stage can reduce yield in crops. Role of Sulphur Sulphur helps in formation of chlorophyll which permits photosynthesis. Sulphur is a constituent of cysteine, cystine and methionine (three s-containing amino acids) which are building block of protein. Approximately 90% of plant Sulphur is present in these amino acids. Sulhpur is essential for synthesis of oils hence adequate sulphur is very important for oilseeds. Sulphur activates enzymes which help in bio chemical reaction within the plant. Sulphur increases crop yiled and improves product quality. Mode of ActionThiobacillus thiooxidans produces organic acids and converts the insoluble form of sulphur into available form through lowering the soil pH and breaking down the complex. BenefitsProvides Sulphur already available in the soil in fixed form. Eco-FriendlyThe product is extremely safe and non-toxic to human beings, plants, animals, birds, fishes and all other non target organisms. Contains no phytotoxicity and exempted from residue analysis. Method of UseMix recommended quantity of the product with well decomposed farm yard manure or farm soil and broadcast during the last ploughing or sowing followed by irrigation. An evening time is ideal for broadcasting this product. In case of liquid formulation, shake the bottle well before use. Once a bottle is opened the entire content is to be used at once. This product should not be mixed with any antibacterial agent or any chemical fertilizer. Recommended forMillets, Oilseeds, Fruits & Vegetables, Coconut, Oil palm, Cotton, Chilly, Lime, Tea, Banana, Flowers, Spices, Contiments, Herbs, Perinnial trees. Dose7 kg per ha or 2 ltr per ha StorageStore the bottles in a cool and dry place away from direct heat and sunlight. NoteWe can provide a consortium/mixture of various bacteria/fungi/micro organisms as per requirement. VAM (Vesicular Arbuscular Micorrhizae) Spore CountFormulation 10 to 103Wettable Powder (WP), Granule (GR) and Aqueous Solution (AS) Tierra Overseas is manufacturer and exporter of high quality VAM (Vesicular Arbuscular Mycorrhiza) in India. 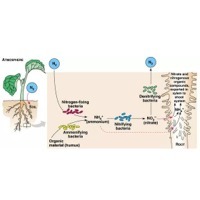 Mode of ActionThe fungus provides mutualistic association between roots and nutrients by penetrating in the plant root cells and thereby producing balloon like vesicles. Due to this formation, the nutrient uptake area of the plant increases. The mycelium have higher water and mineral nutrient absorptivity due to large surface area of fungal hyphae, thus improving mineral absorption capability of the plant. Soils with a basic pH has demineralized phosphate ions which the plant roots alone are unable to uptake. The mycelium of mycorrhizae access these phosphorous source and make them available to the host plant. As the mycelia are much smaller in diameter, they are exposed to greater volume of soil which results in a larger area for nutrient absorption. Due to this feature, they prove very beneficial in a poor nutrient soil. Benefits Increases root area of the plant through hyphae. Increases nutrient uptake including primary and secondary nutrients. Increases immune system of the plant. Increases disease, drought and salinity resistance. Can be used to treat Seed, Seedling, Sett, Soil and Plantation crops. Eco-FriendlyThe product is extremely safe and non-toxic to human beings, plants, animals, birds, fishes and all other non target organisms. Contains no phytotoxicity and exempted from residue analysis. Method of UseMix recommended quantity of the product with well decomposed farm yard manure or farm soil and broadcast during the last ploughing or sowing followed by irrigation. An evening time is ideal for broadcasting this product. In case of liquid formulation, shake the bottle well before use. Once a bottle is opened the entire content is to be used at once. This product should not be mixed with any antibacterial agent or any chemical fertilizer. Recommended forMillets, Oilseeds, Fruits & Vegetables, Coconut, Oil palm, Cotton, Chilly, Lime, Tea, Banana, Flowers, Spices, Contiments, Herbs, Perinnial trees. Dose4 kg per ha or 2 ltr per ha StorageStore the bottles in a cool and dry place away from direct heat and sunlight. NoteWe can provide a consortium/mixture of various bacteria/fungi/micro organisms as per requirement. Acetobacter diazotrophicus CFUFormulation 1 x 108 per mlAqueous Solution Mode of ActionAcetobacter diazotrophicus colonizes the root and lower stem epidermal surface which then uses root tips and lateral root junctions to enter the plant where it is distributed around the plant in the transpiration stream. The xylem vessels in the dense shoots of mature plants are also a possible site of N2-fixation by diazotrophs as they provide the low pO2 and energy as sucrose necessary for nitrogenase activity. Benefits Responsible for N2 fixation associated with the plants. Tolerance to low pH, and high sugar and salt concentrations, lack of nitrate reductase. Nitrogenase activity which tolerates short term exposure to ammonia. Eco-FriendlyExtremely safe to mammals, human beings, animals, natural parasites, predators, non target insects, fishes, birds, etc. Classified as Class IV, low hazardous (green label) pesticide. No phytotoxicity and exempted from residue analysis. Method of Use Mix recommended quantity of the product with well decomposed farm yard manure or farm soil and broadcast during the last ploughing or sowing followed by irrigation. An evening time is ideal for broadcasting this product. The recommended quantity can also be used by mixing in 200 litres of water in drip irrigation. Mix Acetobacter diazotrpophicus 5 to 10 ml per lit. of water and spray in standing crop in the evening to get better results. In case of liquid formulation, shake the bottle well before use. Once a bottle is opened the entire content is to be used at once. This product should not be mixed with any antibacterial agent or any chemical fertilizer. Recommended forSugarcane and Coffee Dosage2 ltr per ha StorageStore the bottles in a cool and dry place away from direct heat and sunlight. NoteWe can provide a consortium/mixture of various bacteria/fungi/microorganisms as per requirement. Azospirillum lipoferum Extensive genetic, biochemical and ecological studies have ranked Azospirillumas one of the best characterized general among associative plant growth promoting rhizobacteria. Tierra Overseas is manufacturer and exporter of high quality Azospirillum lipoferum in India. CFUFormulation 1 x 10^9 per gmAqueous Solution (AS) 1 x 10^9 per mlWettable Powder (WP) Mode of ActionUnder micro-aerobic conditions at low nitrogen levels, Azospirillum can convert atmospheric nitrogen into ammonium through the action of the nitrogenase complex. This enzyme is built from two components: the dinitrogenase protein (MoFe protein, NifDK), which contains a molybdenum-iron cofactor, is the site of N2 reduction; the dinitrogenase reductase protein (Fe protein, NifH) transfers electrons from an electron donor to the nitrogenase protein. Auxins, Cytokinins and Gibberellines are types of plant growth promoting substances detected in the supernatant of Azospirillum cultures. Auxin indole-3-acetic acid (IAA) is the quantitatively most important phytohormone produced by Azospirillum. Bacterial phytohormone production causes the detected changes in root morphology after Azospirillum inoculation, which in turn may be related to enhance mineral uptake. BenefitsAn increased number of lateral roots and root hairs enlarges the root surface available for nutrients. This results in a higher nutrient uptake by inoculated roots and an improved water status of the plant, which in turn could be the main factor enhancing plant growth. It can be used for seed treatment, Seedling dipping, Sett tratement, Soil application and for Plantation crops. Eco-FriendlyExtremely safe to mammals, human beings, animals, natural parasites, predators, non target insects, fishes, birds, etc. Classified as Class IV, low hazardous (green label) pesticide. No phytotoxicity and exempted from residue analysis. Method of UseMix recommended quantity of the product with well decomposed farm yard manure or farm soil and broadcast during the last ploughing or sowing followed by irrigation. An evening time is ideal for broadcasting this product. In case of liquid formulation, shake the bottle well before use. Once a bottle is opened the entire content is to be used at once. This product should not be mixed with any antibacterial agent or any chemical fertilizer. Recommended forMillets, Oilseeds, Fruits & Vegetables, Coconut, Oil palm, Cotton, Chilly, Lime, Tea, Banana, Flowers, Spices, Contiments, Herbs, Perinnial trees. Dose2.5 kg per ha or 2 ltr per ha StorageStore the bottles in a cool and dry place away from direct heat and sunlight. NoteWe can provide a consortium/mixture of various bacteria/fungi/microorganisms as per requirement. Azotobacter Azotobacter are nitrogen-fixing bacteria which fix molecular nitrogen present in the atmosphere; without creating any symbiotic relation with plants. CFUFormulation 1 x 109 per gm Aqueous Solution (AS) 1 x 109 per mlWettable Powder (WP) Mode of ActionAzotobacter consists of a range of enzymes required for nitrogen fixation (ferredoxin, hydrogenase and nitrogenase). Nitrogen fixation requires a large amount of energy in the form of adenosine triphosphate. As the process of Nitrogen fixation is highly sensitive, Azotobacter develops a defensive mechanism against oxygen which helps in reduction of oxygen in the cells. BenefitsFixes atmospheric Nitrogen. Increases soil fertility and stimulates plant growth. Decreases the use of Urea (Chemical Fertilizer). Reduces the cost of cultivation. Used for Seed treatment, Seedling dipping, Sett treatment,Soil Application and forPlantation crops. Eco-FriendlyExtremely safe to mammals, human beings, animals, natural parasites, predators, non target insects, fishes, birds, etc. Recommended forMillets, Oilseeds, Fruits & Vegetables, Coconut, Oil palm, Cotton, Chilly, Lime, Tea, Banana, Flowers, Spices, Contiments, Herbs, Perinnial trees. Dose2.5 kg per ha or 2 ltr per ha Method of UseMix recommended quantity of the product with well decomposed farm yard manure or farm soil and broadcast during the last ploughing or sowing followed by irrigation.An evening time is ideal for broadcasting this product. In case of liquid formulation, shake the bottle well before use. Once a bottle is opened the entire content is to be used at once. This product should not be mixed with any antibacterial agent or any chemical fertilizer. StorageStore the bottles in a cool and dry place away from direct heat and sunlight. Bacillus megaterium (Phosphate Solubilising Bacteria) ISymptoms of Phosphorous Deficiency The plants are usually dark bluish-green in color with leaves and stem becoming purplish. The degree of purple is influenced by the genetic makeup of the plant, with some hybrids showing much greater discoloration than others. The purplish colour is due to accumulation of sugars that favours the synthesis of anthocyanin (a purplish-colored pigment), which occurs in the leaves of the plant. The principal mechanism for mineral phosphate solubilization is the production of organic acids; acid phosphatases play a major role in the mineralization of organic phosphorous in soil. The use of phosphate solubilizing bacteria as inoculant simultaneously increases P uptake by the plant and crop yield. Tierra Overseas is manufacturer and exporter of high quality Bacillus Megaterium (Phosphate Solubilising Bacteria) in India. CFU Formulation 1 x 109 per mlAqueous Solution (AS) 1 x 109 per gmWettable Powder (WP) Mode of ActionThe use of phosphate solubilizing bacteria as inoculant simultaneously increases P uptake by the plant and crop yield. Benefitsâ?¢ Lowers pH of the soil in high pH land. â?¢ Enhances chelation of the cations bound to P. Method of UseMix recommended quantity of the product with well decomposed farm yard manure or farm soil and broadcast during the last ploughing or sowing followed by irrigation. An evening time is ideal for broadcasting this product. In case of liquid formulation, shake the bottle well before use. Once a bottle is opened the entire content is to be used at once. This product should not be mixed with any antibacterial agent or any chemical fertilizer. Recommended forMillets, Oilseeds, Fruits & Vegetables, Coconut, Oil palm, Cotton, Chilly, Lime, Tea, Banana, Flowers, Spices, Contiments, Herbs, Perinnial trees. Dose10 kg per ha or 2 ltr per ha StorageStore the bottles in a cool and dry place away from direct heat and sunlight. NoteWe can provide a consortium/mixture of various bacteria/fungi/micro organisms as per requirement. Bio-Fungicide SANJEEVNI (Trichoderma Viride 1% W.P) W.P. CFU - 2 X 109 per gram Packaging : 250gm, 500gm, 1kg, 25kg Documents : MSDS / LABEL / CIB Registration License / COA / Trial reports Mode of Action : The hyphae of Trichoderma wrap around the pathogen fungi and produce antibiotics and extracellular enzymes, which lyses the cell wall of these pathogens that damage them. The invading fungus eventually collapse and disintegrates. Effective Against Diseases : It is a natural bio-fungicide, highly effective in controlling wide range of soil borne crops disease caused by Fusarium, Charcoal rot, Black scurf, Karnal bunt, Silver leaf of plum & peach, Rhizoctonia, Pythium, Schlerolims, Verticillium, Alternaria, fungal pathogen. Target Crops : Cereals, Pulses, Oil seeds , Cotton, Capsicum, Chilies, Cauliflower, Brinjal, Tomato, Potato, Onion, Peas, Beans, Ginger, Turmeric, Cardamom, Tea, Coffee and Fruits crop- Apple, Citrus, Grape , Pomegranate , Banana etc. Method of Application and Dosage : Seed Treatment - Mix 8 10 gm. SANJEEVNI in 50 ml. of water and applied on 1 kg of seed uniformly. Shade dry the seeds for 20 30 minutes before sowing Seedlings Treatment Dissolve 500 gm. W.P SANJEEVNI in 50 lit. of water, Dip seedling roots for about half an hour in the suspension and transplant immediately. Nursery seed bed Treatment Mix 500 gm SANJEEVNI in 10 kg of well decomposed FYM/Compost/Vermi compost and broadcast in 400 Sq.mt. area and incorporate in soil up to 15 20 cm depth. Soil Drenching Through Drip Irrigation Mix 1. 2 kg W.P SANJEEVNI in 100 lit. of water and drench the soil in 1 acre. Horticulture crops Mix 25 50 gm. SANJEEVNI per plant in sufficient quantity of well decomposed FYM/Vermi compost/Compost/field soil and apply the mixture in effective root zone of fruit tree. Compatibility : Compatible with organic manures and bio-fertilizers. Don’t mix with chemical fungicides. It can be used alternatively with insecticides & bactericide. Growth Promotion Activity : Suppress soil borne diseases caused by pathogens and promote seed germination and plant growth.